What is the meaning of DOA? The term Defect on arrival (DOA) refers to a component that is already broken at the delivery. It can happen to every high-tech manufacturer and is often the source of nasty, fierce discussions with customers. Manufacturers must also make additional charges to still solve the problem and in some cases they even receive a blunt claim from their customer. They are high in the top 10 annoyances of high-tech manufacturers: Defect On Arrivals (DOA’s). Customers who receive defective components, are a source of difficult discussions about system availability, service level agreements and claims. Remarkably often DOAs are not high on the priority list of manufacturers. Even though addressing these problems can lead to a quarter more profit. It can always happen: an entire department that is at a standstill because of a fault in one of the machines or systems. The cause is usually found quickly. One of the components is broken and must be replaced. The manufacturer of the machine, a logistics service provider, or one of the suppliers takes quickly a replacement component from the parts store, puts it in a box and sends it with the first best courier to the company that is at a standstill. But when the service engineer unpacks and installs the component, he responds bewildered; the machine still does not work. Cause: the sent component is also broken! FPC has a DOA calculator to quickly make an estimate of the effect of a DOA reduction on your organization. Altough everyone understands the meaning of DOA’s, in practice, there are small differences in the definition. Also the way DOA’s are measured differs from company to company. Which definition of performance indicator is used, the figures of the various high-tech manufacturers are eventually fairly consistent. Some companies talk about 0.2 percent others indicate that the amount of damages due to DOA can rise to 0.5 percent of the annual operating revenues. This justifies the conclusion that by preventing DOA in the supply chain these companies may make average about 0.2 to 0.5 percent extra. Companies indicate that the costs associated with repairing DOA can amount ten times of the cost of the DOA itself. Think of special transport, field engineers who need to remain at the appropriate place longer, downtime of the machine and additional logistical and administrative actions that must be performed. If we look at the costs that way, we do not talk about a potential cost saving of 0.2 to 0.5%, but about a potential cost saving of 2 to 5%. 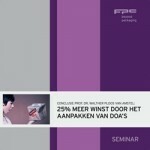 These and many other facts about DOAs are summarized in the research of Prof. Dr Walther Ploos van Amstel: “25% more profit by tackling DOAs’. preventing DOAs in your organisation?